Woke up this morning to find that Gustav is yet another example of why it is so hard to forecast hurricanes, even when the factors seem to be fairly well known. 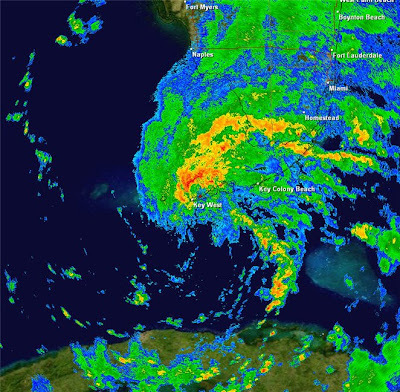 After crossing Cuba, Gustav has not (yet) been able to get it's act back together as well as we thought this time yesterday. The storm structure is somewhat ragged with an elliptical eye all but obscured on satellite, dry air is beginning to wrap into the storm, and upper-level shear is starting to increase slightly. In addition, it's pretty much over the most favorable water it will encounter between now and landfall. Given all this, Gustav is still powerful and impressive in size. Tropical storm conditions can be felt as far away as 200 miles from the center, meaning these conditions will begin affecting the immediate Gulf coast overnight tonight. The NHC is predicting landfall by early afternoon tomorrow (Monday) along the central Louisiana coast as a major (Cat 3) storm. Hurricane Warnings are posted for the LA, MS, and AL coastlines and the entire city of New Orleans is under mandatory evacuation. Here in Memphis, Amtrak is bringing up to 3,600 NoLa residents to shelters until the storm passes. Seems federal, state, and local agencies are being a little more proactive this time around after the disastrous response to Katrina. 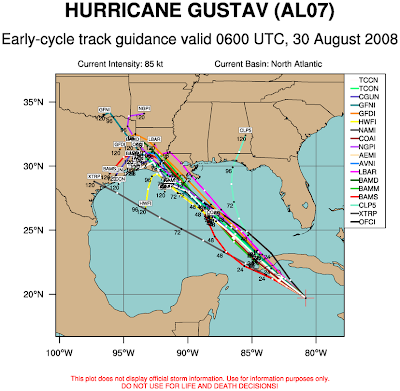 The track of Gustav is the one thing that has changed little, at least through landfall. It is still expected to quickly move over the south-central LA coast tomorrow and then slow fairly dramatically Tuesday as it turns WNW or W towards west-central LA and eastern TX. The track beyond about 48 hours is difficult to place as models are having a hard time with a slow-moving Gustav. With a more westerly track into TX favored, this would mean lower rain chances for the Mid-South, but I do expect we'll see enough cloud cover to hold down daytime temps during the first half of the week. In fact, cirrus clouds along Gustav's outer periphery are already encroaching on the area and a steady easterly wind will pick up tomorrow. Look for scattered showers and t'storms for possibly a good portion of the upcoming week, depending on the track of Gustav's remnants. I have posted a new Tropical page on MemphisWeather.net that you will want to check out that has the latest satellite and radar imagery, forecast tracks, and Hurricane Center bulletins. Find it here or go to MemphisWeather.net and click the link on the front page. As expected when I last wrote and predicted by the models (though not to this extent), Gustav broke free from Jamaica, hit the deep warm waters of the Caribbean where very little wind shear exists, and exploded. The storm went from minimal Cat 1 at 3:15pm yesterday to strong Cat 3, now with 120 mph sustained wind! 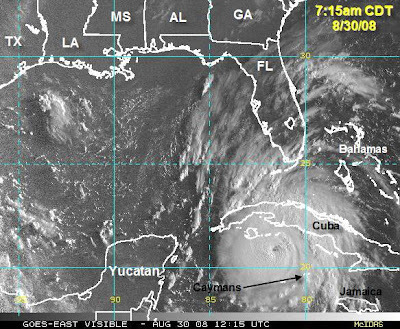 The official forecast calls for additional strengthening to about Cat 4 as it reaches western Cuba. This will be a devastating storm for western Cuba, including the Isle of Youth, where up to 2 feet of rain is possible along with a storm surge of 14-19 feet near the center of the storm. This morning's radar imagery from Cuba, as well as the first visible satellite shot of the morning over the Gulf, taken at 7:15am, is shown below. The projected path of the storm continues to take it into the southern Gulf as a major Cat 3 storm by tomorrow. As it approaches the U.S. mainland, the uncertainty starts to rise in it's track and intensity. Regarding intensity, while conditions remain optimal through tomorrow, by Sunday night, shear is expected to increase and the waters actually cool slightly, which both could promote a slight weakening by the time it reaches the northern Gulf. Also, history tells us that storms just don't maintain "monster" status for an extended period of time - conditions don't stay that good for more than a day or so. Should Gustav reach Cat 4 or even 5 (which is not out of the question), I'm not sure with the conditions I mention above that it will be able to maintain that all the way to U.S. landfall. (Not that a Cat 2/3 storm is anything to take lightly of course, but total devastation would not be as likely). As for the track, models continue in two camps, though one or two are starting to take on traitor status and jump from one to the other. Some continue to move Gustav directly northwest with landfall along the central Louisiana coast Monday night (which the Hurricane Center still is going with). But many are now indicating the high over the Great Lakes will not only shift the track left, but slow the storm down and then bend it back to the southwest after making landfall (or even before landfall according to a couple of models), increasing a flooding risk for eastern Texas and Louisiana by the middle of next week. See the track map below. In any case, it does now appear that the high pressure over the eastern U.S. will have a strong impact on Gustav and significant flooding could be a major part of this storm's history when all is said and done. We'll continue to monitor. As of this afternoon, Gustav has once again reached Hurricane status, increasing to 75 mph as it continues to expand into an increasingly large storm. After passing over Jamaica early today and weakening slightly, it now heads for the Caymans, then turns northwest with one more small obstacle in its path - eastern Cuba. This portion of Cuba is fairly narrow and should not have a great effect on the storm. Forecasts point to the likelihood of a major hurricane (Cat III)as it heads across the Gulf of Mexico Sunday and Monday for an eventual landfall on Monday night or early Tuesday. On it's current track, landfall is expected along the Louisiana coastline, however this far out, the margin of error is still large enough that everyone from Houston to Pensacola should be prepared for at least tropical storm, if not stronger, conditions. Tropical storm conditions will start to be felt as early as Monday morning along the coast ahead of the storm. Evacuation orders are already in place or take effect tomorrow for many locations, including the city of New Orleans, where today they commemorated the landfall of Hurricane Katrina 3 years ago to the day. We can only hope that Gustav does not inflict the magnitude of damage that occurred with Katrina and that emergency and government officials are more prepared than 3 years ago. 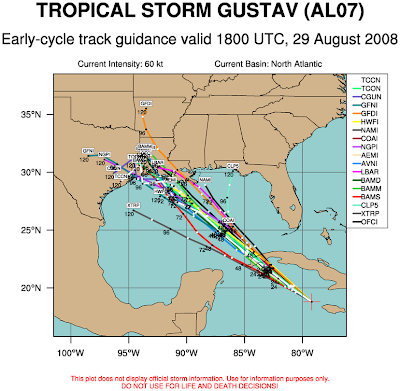 Below is the current forecast track from the Hurricane Center as well as a plot of most of the computer models' forecasts indicating the degree of error that still exists - the spread lies all the way from Houston to New Orleans. The big question mark seems to be the strength of a high pressure system due to be over the Ohio Valley early next week - a stronger high would tend to steer the hurricane further west (which some models are forecasting) while a weaker high will allow the storm to continue on a due northwest track closer to New Orleans, which others are forecasting will happen. Only time will tell. Though this storm will get all the press for the next several days, strengthening T.S. Hanna in the Atlantic also bears watching as it too could affect the U.S. mainland later next week. After a wet couple of weeks that has helped to keep temps cooler than normal, Mid-South weather will once again heat up to above normal the next few days. A weak cold front will move ito the region late tomorrow afternoon and linger Saturday before washing out. This will bring a low chance of t'storms beginning north of the city tomorrow afternoon and through the I-40 corridor Friday evening through Saturday evening. Highs will be in the lower 90s with heat indices approaching the upper 90s today and tomorrow. 90-93 degree highs are expected to continue into early next week. Next week's forecast is highly dependent on the eventual track of Gustav, but it appears like there could be a chance of some precipitation from it's remnants by the middle of next week over the Mid-South, which will help to bring temperatures down as well. A band of very heavy rain and embedded thunderstorms rotated westward across the metro area this afternoon as cells formed quickly in the afternoon heat along a convergence zone spinning around the remnants of Fay. A CoCoRaHS 4" rain gauge at MemphisWeather.Net in north Bartlett recorded 1.78" of rain, most of it falling in a 60-minute period between 5-6pm. About 5 miles south in the center of Bartlett, an unofficial recording of 2 3/4" of rain fell in that same hour! Flash flloding was observed as water filled drainage ditches and gutters and overflowed into the streets. WXLIVE! recorded a peak rain rate of 5.59"/hr and a max wind gust of 22 mph. A radar image of the storms as they moved through is shown. T.D. 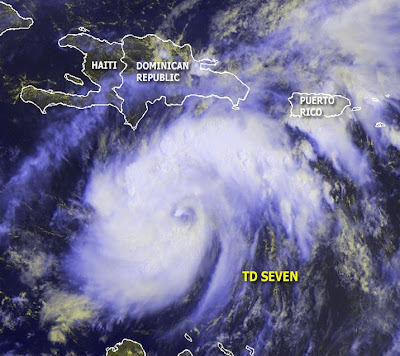 Seven was officially classified as a tropical system by the Hurricane Center this morning, about the same time as this satellite shot was taken. Pretty impressive looking for only being a depression. Expect it to be named Gustav before too long. Movement is NW@15 with the track currently taking it up over Cuba in a few days. Hard to say right now whether it will go north or south of Cuba and how it will affect the Gulf. 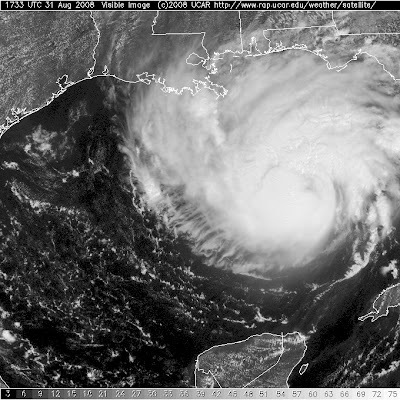 Fay drenches north FL, heads for the Mid-South? Since Wednesday, Fay has made her presence known across northern and eastern Florida (where some locations have gotten as much as 25-30" of rain) and southern Georgia. Right now, rain has moved into southern Alabama, but a pretty good batch of showers has also separated some from the main core of the storm and is working it's way across northern Alabama, Mississippi, and southwest Tennessee, which could bring some sprinkles or light rain to the metro area today. Our cloud cover today is certainly part of Fay's broad circulation. I expect Sunday to actually have lower chances of rain than today, but as Fay continues to move west and then slightly north into southern MS, look for a better chance of rain and thunderstorms again on Monday. Nonetheless, it will still be a fairly humid weekend and early part of the work week with a lot of Gulf moisture in place across the region. Even northeasterly surface wind around the general circulation of Fay will not lower humidity values significantly. Fay took a day and a half to cross diagonally across Florida, from landfall around 5am CDT Tuesday south of Fort Myers/Naples until reaching the east coast at Cape Canaveral, east of Orlando, this afternoon. Not only has Fay's path been fickle (from an early landfall south of the expected landfall point), her intensity has been very hard to forecast as well! Making landfall 4-6 hours early coupled with dry air on her west side (making for a very asymmetric storm) kept her from reaching hurricane strength before coming ashore yesterday. Then, several hours after landfall, she actually increased in intensity slightly before weakening as typically happens while over land. One thing is for certain, many areas of Florida, particularly the east-central portion of the state, that were in need of rain are getting it! Some unofficial totals are nearing 2 FEET of rain since yesterday!! Fay has now re-emerged over water into the Atlantic Gulf Stream where she is expected to re-organize slightly and make a left turn, heading back into northeast FL tomorrow. After that, Mother Nature only knows where fickle Fay will go, but tracks are pointing towards a slow progression across the FL panhandle or southern Georgia and Alabama. However, there are hints from a couple of models that perhaps a more southerly track will occur, which would mean more water time over the Gulf. This could be bad news for perhaps a third (fourth if you count Key West) landfall somewhere along the central Gulf coast early next week. Time will tell, and as unpredictable as she is, anything is certainly possible. After bringing tropical storm wind and rain to Puerto Rico, Hispaniola, portions of the Bahamas, and Cuba, Fay emerged into the Florida Straits between Cuba and the Florida Keys this morning and has just passed Key West. Though not quite a hurricane, it has taken on a much better appearance in the past two hours with better banding of thunderstorms around the center and rapidly cooling cloud tops as convection boils near the storm's center. We'll see what NHC says about it at 4pm, but I wouldn't be surprised to see it raised from 60 mph to 70, just shy of a hurricane. Storms rumble... and Fay is born! 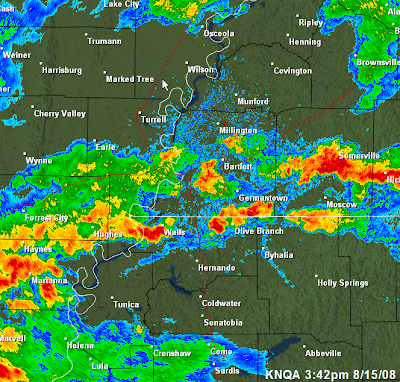 Radar image of the storms as they head slowly east through the region. Many of these formed on an outflow boundary from storms in northeast Arkansas earlier in the day. Also, the Hurricane Center has started advisories on newly-formed Tropical Storm Fay, just as I suspected they would a couple of hours ago. Wow, what a week it's been. Work has been incredibly busy this week and other stuff has taken up my free time, so that's why it's been nearly a week since blogging. A hefty change in the forecast from yesterday morning to today and the result is rain and t'storms around the area a day earlier (today) and a pretty nice weekend on tap! It had looked like today would be dry and the weekend wetter, but that apparently won't pan out. Scattered storms around the area this afternoon will continue through the evening hours. Most people have a decent chance of getting at least a little rain. A few showers could linger overnighe, but with only a 20% chance or less of rain tomorrow and a dry day Sunday, it should be nice as temps top out in the upper 80s and humidity is a non-factor. Can't ask for much better for mid-August! In the tropics, the Hurricane Center has yet to jump onboard with the low pressure east of Puerto Rico. Expect this could become a tropical storm without too much difficulty, though it's path looks to take it over a fair amount of terrain in Hispaniola and Cuba. If it can survive, there is potential for the storm to really gear up as it moves into the Florida Straits or the Gulf Stream. Long-range models are all over the place with it's eventual track, from moving it into the Gulf of Mexico, to striking south or eastern FL, to turning it north and moving it towards North Carolina! We'll have to keep our eye on eventual T.S. Fay. On a side note, anybody but me enjoying watching the Olympic coverage on NBC or cable? It is fun to watch for a change. Talk about reality TV! Really off how things sometimes work out.. call it what you will, I just think it's coincidence. Yesterday was 8/8/08 as you all know. The High Temp at the official recording station in Memphis (MEM INT'L) was 88. The high on MY weather station - WXLIVE! - was 88.8! 88 also happened to be the warmest it got anywhere in the Mid-South yesterday, which when combined with the low humidity and sunny skies meant it was just a perfect, almost early fall-like day! One more today before the rain chances re-appear tomorrow, which I don't think anyone will complain about. A drenching system is forecast to move southeast through AR and into MS. Memphis should be right around the edge of that precipitation shield, so chances are better for President's Island than they are for Arlington, but hopefully everybody will get more rain. Thunderstorm chances are actually fairly slim with this system. The map below shows the forecast precip amounts from 6am Sunday through 6am Monday. Birds, bats, bugs, and all sorts of animated critters can be seen by Doppler radar. One time when it's particularly interesting to watch the radar loops is when flocks depart from their overnight roosts at sunrise and head out all across the countryside. The resulting radar "echo" takes on the look of an exploding donut (or a pebble being dropping in a pond), expanding in all directions before vanishing. A classic signature is shown in this radar loop, which depicts the sunrise departure of thousands and thousands of birds from their roosts in Reelfoot Lake in Lake County, TN (look near the top of the image by Dyersburg). BREAKING NEWS - Northern Shelby Co. gets rain! It's hard to believe, I know, but northern Shelby County finally got some much needed rainfall! The radar picture below shows the t'storms as they moved east through the area. As measured by WXLIVE! in Bartlett, nearly 1/2" has fallen since ~5:40am. I got more in 30 minutes than I totaled for all of July! With t'storms continuing in the forecast today, could we actually see more? Nah..... that's asking too much. Thank you Mother Nature! Now as the power flashes from lightning, it's time to sign off! Finally, I get to write a forecast I am more enthused about presenting to my visitors! The end of the current heat and humidity spell is winding down (the last Heat Advisory expired last evening) as high pressure starts to lose it's grip and a cold front approaches the region with a pretty decent chance of bringing some rain and thunder. Today will still be hot, but not quite Heat Advisory criteria, with highs in the mid 90s and a heat index from 100-105. A stray storm is possible, especially to the north of the city, this afternoon. By tonight, storms to our north will being dropping into the area late, with a good chance of rain during the day tomorrow. A few storms could be borderline severe with moderate-sized hail and high wind the main concerns. Chances of rain will linger through Thursday night until the front pushes through (yes, this one should actually move all the way through the area!). With the front to our south, we are setting up for a beautiful (for August) weekend with lots of sun, low humidity, and highs near 90 starting Friday. By the time school starts for most kids on Monday, the front pulls back to the north and rain chances re-appear to start the week. If nothing else, it should help keep the temps under control! To see the complete MWN forecast, click here. Also, thanks to the Cookeville Weather Guy for posting on his blog about the tornadic storms that ripped through Chicagoland on Monday night. Check out his blog for more(www.CookevilleWeatherGuy.com) or read about the storms that forced the evacuation of Wrigley Field during a Cubs/Astros game by clicking here. First, the NWS cancelled our Heat Advisory mid-afternoon today as heat indices weren't reaching the critical 105 degree level. The reason? Dewpoints. See my blog from July 11 on The Importance of Dewpoint. Even though the temperature climbed to near 100 today, the absolute amount of moisture in the air (dewpoint) fell this afternoon and heat indices didn't reach the necessary 105 degrees to constitute a heat advisory. This tells you just how difficult it can be to forecast something like the dewpoint. Yesterday, we had no trouble reaching 105-110 heat index as dewpoints stayed in the mid 70s. Today, they dropped into the 60s. The NWS does expect dewpoints to be back up tomorrow (as do I) so the Heat Advisory has been re-issued for tomorrow afternoon. We'll watch the dewpoints to see! Also, Tropical Storm Edouard (or just Eddie) is churning in the northern Gulf just offshore Louisiana. Eddie's moving west towards the Houston/Galveston area with a projected landfall around Galveston Bay mid-morning Tuesday. Max wind, though just 45 mph now, are expected to increase steadily overnight, reaching just less than hurricane strength by landfall (65-70 mph). The inland track takes him into central TX with no impact to the Mid-South (unless it pulls a Dolly!). Fortunately he isn't near the storm Rita was a few years back when the entire city of Houston tried to evacuate - leaving motorists stranded on interstates for HOURS and HOURS as the storm side-swiped the city. Finally, since it's my blog, I guess I can brag just a little... The MWN Forecast accuracy stats for July are in and my second period temperature forecasts averaged an error of just 0.85 degrees. That means of forecasts made for the second period (47 morning forecasts of that night's low and afternoon forecasts of the next day's high), I was off by less than a degree. For all MWN temperature forecasts made (235 total), my margin of error was 1.46 degrees - my best showing since July 2003. For more accuracy stats, visit the MWN Forecast Accuracy page. THE NATIONAL WEATHER SERVICE IN MEMPHIS HAS ISSUED AN EXCESSIVE HEAT WARNING...WHICH IS IN EFFECT UNTIL 8 PM CDT THIS EVENING. A HEAT ADVISORY IS ALSO IN EFFECT FROM 8 PM THIS EVENING TO 8 PM CDT SUNDAY. HOT TEMPERATURES COMBINED WITH A HUMID AIRMASS WILL PRODUCE HEAT INDEX READINGS OF 110 DEGREES OR GREATER THIS AFTERNOON. AN EXCESSIVE HEAT WARNING MEANS THAT A PROLONGED PERIOD OF DANGEROUSLY HOT TEMPERATURES WILL OCCUR. THE COMBINATION OF HOT TEMPERATURES AND HIGH HUMIDITY WILL COMBINE TO CREATE A DANGEROUS SITUATION IN WHICH HEAT ILLNESSES ARE LIKELY. DRINK PLENTY OF FLUIDS...STAY IN AN AIR-CONDITIONED ROOM...STAY OUT OF THE SUN...AND CHECK UP ON RELATIVES AND NEIGHBORS. A HEAT ADVISORY MEANS THAT A PERIOD OF HOT TEMPERATURES IS EXPECTED. THE COMBINATION OF HOT TEMPERATURES AND HIGH HUMIDITY WILL COMBINE TO CREATE A SITUATION IN WHICH HEAT ILLNESSES ARE POSSIBLE. DRINK PLENTY OF FLUIDS...STAY IN AN AIR-CONDITIONED ROOM...STAY OUT OF THE SUN...AND CHECK UP ON RELATIVES AND NEIGHBORS. On an unrelated note, I watched the Brian Teigland Memorial service this morning on ABC-24/WPTY. Very well done and an exceptional tribute to Brian's life... The Memphis market will miss his personal touch to doing TV weather.